Blacksburg is an incorporated town located in Montgomery County, Virginia, United States, with a population of 39,573 at the 2000 census. Blacksburg, Christiansburg, and Radford are the three principal jurisdictions of the Blacksburg-Christiansburg-Radford Metropolitan Statistical Area which encompasses those jurisdictions and all of Montgomery, Pulaski, and Giles counties for statistical purposes. The MSA has an estimated population of 157,614 and is currently one of the faster growing MSAs in Virginia. Blacksburg is dominated economically and demographically by the presence of Virginia Polytechnic Institute and State University (better known as Virginia Tech), a Virginia land-grant university. Located at the intersection of Patrick Henry Drive and South Main Street. 15,000 VCD. 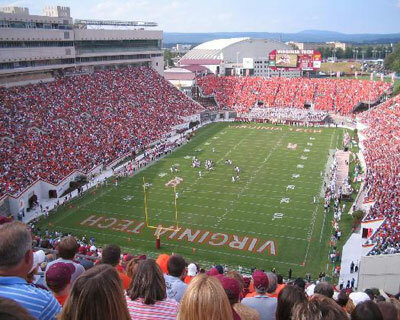 Campus of Virginia Tech located less than 1 mile away with it's 25,000 students. Numerous apartments in the immediate area. Outparcels Available. Centrally Located Retail in Downtown Blacksburg.